Chief Blur Buster wrote: If anyone is willing to do these kinds of tests in such depth, I'm interested in poring over those charts. I would if i had the tools. 'I fast reaction' could volunteer, he seems to have it all covered. If he is willing of course. I think QuakeWorld can be a good game to make these tests. It has a bultin server so ping is 0. And you can create the environment you need with this game. MT_ wrote: One relief of that aspect is the fact that the OS is mostly closed source, and only a limited amount of 'tweaking' can be done on it! Most things people change just affect cpu overhead and the impact is minimal, only too much of it can cause a spike wich will be noticeable, i really doubt it can increase input lag. You shouldn't need to touch system timers for example. Windows decides wich one to use based on the hardware you have. 'I fast reaction' recommends to disable HPET in Bios but then enables it in the system. Makes no sense. Last time i checked, Windows used HPET+TSC at boot and then only TSC in the system. So you don't need to disable it in BIOS and shouldn't enable it in the OS as the only timer. Games/applications that use QueryPerformanceCounter could get reduced performance if HPET is enabled in the OS. Why don't you play true fullscreen? Doesn't the input lag come from that windowed mode? Seems there are alot of CSGO players. Do they play in W7 too? I didnt mean the difference in fps would noticably or at all affect input lag, I mean the fact that two OS behave differently in multipe aspects could indicate much has changed under the hood, it could be anything at this point. In my book there is an 'optimized' path from peripheral input to display output, and an 'unoptimized' path which feels what W10 currently is. Call it input to pixel precision? I play exclusive full screen, always. 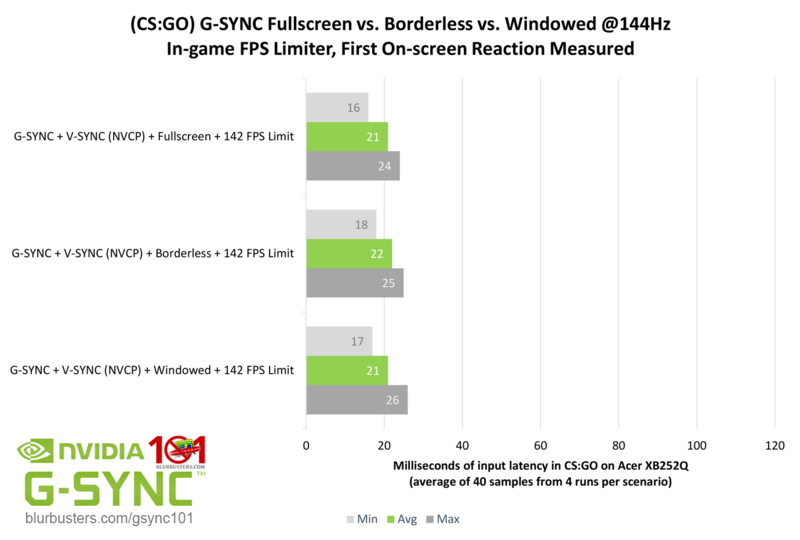 I ment that Windows 10 has forced DWM V-sync, and in any case 1 frame of delay when using Gsync (full) windowed. Major flaw in W10 imho, as games like CSGO and a few others run horrible in full screen (Alt tab can easily take 10 seconds). The main game I play (MWO) in full screen literally go nuts if I alt-tab in specific scenarios, although works perfect otherwise. (Both actual game flaws, not OS/Hw specific). (Full)windowed without DWM In W7 is still a very good option for high FPS games like CSGO, not to much for low fps games as tearing would become annoying, hence why full screen + G-sync is mostly the best option in general. But taking all that out of the equation, the fact that there is no way in W10 to avoid that 1 frame of delay, is in my book an inherit flaw of the OS. The recent 'Full screen optimization' is still in very early development and seems more of a dirty fix to keep then from finding a 'proper' solution. As for competitive CSGO players? No clue, that info seems almost impossible to find. Keep in mind that Esport players are often sponsored, and its a 'tight' little crew thats probably incredibly hard to get in as a lone player. They use mice by brands that they get sponsored by, even if they don't personally prefer said mice and could probably play better with their own prefered peripherals. Do they use W7 or 10? Who knows. Pretty sure on Esport tournaments they use pre-build/configured PC's all setup by the organizers themselves, to prevent any unfair advantage. One should not compare Esports to home-competitive level play, nor compare twitch shooters vs trackers and other type of games when it comes to input lag, as the difference in types of games greatly affect the threshold on when different types of input lag is felt. I feel we're going off topic here though, but this had to be said. MT_ wrote: I ment that Windows 10 has forced DWM V-sync, and in any case 1 frame of delay when using Gsync (full) windowed. As far as I'm aware, G-SYNC overrides the DWM by forcing a different flip mode when the window is focused/active, thus the usual DWM triple buffer/1 frame added by composition shouldn't apply. Can't guarantee it for 7 (tested on Windows 10 only), but knowing what I do, I'm pretty sure the OS version/build shouldn't matter here; if G-SYNC borderless/windowed mode bypasses Aero/DWM composition by forcing an alt flip mode at the GPU driver-level, then there isn't going to be the usual 1 frame of lag added over exclusive fullscreen, which is what my existing tests showed.